We would appreciate your prayers concerning my return to the states for follow-up care for the pre-cancerous area on my tongue. We had been thinking that I would probably come back to the states at some point in the middle of our first term here in order to have a follow-up visit. But since there have been some very slight changes in the appearance of the area, we have been thinking that I would return sooner and stay long enough for a MOHs procedure in which they try to remove all the abnormal tissue, and for the recovery. After weeks of trying to contact the office, I finally called and got through to the nurse practitioner who has seen me twice along with Dr. Wadsworth. That was a big answer to prayer! She said that I would need to be in GA for 4-6 weeks. We were hoping for more like 2-3 since we will be apart during that time, but that is apparently not long enough for the visit, some scans, the procedure, and the recovery. There are several factors we are trying to juggle as we consider when I should return. The first in my mind is my family. 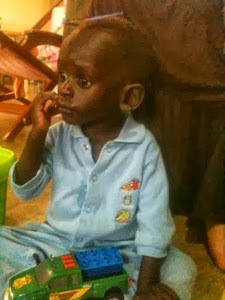 Until mid November we are still living off campus in Jinja and David would not have much help with the children here. Then we will move to a temporary house on campus for two weeks, and then into another missionary family's house while they are on furlough for 6 months. We will move into that house around Nov.30. When we are on campus, David will have more help available. I also want to help my children adjust to moving again. After spending the first part of their lives in the same home and same church, they will be switching to another home and another church. I want to help them with those transitions. A second factor is our work here. David and I are both teaching full-time and he would not be able to continue teaching all six grade levels alone. So we have been leaning toward me coming back at a break between semesters. Our schedule is pretty flexible, but that seems to be the most logical time for me to be gone. Another factor, of course, is that the doctor says that sooner would be better to return than later. He is not very concerned. I have been sending photos of my tongue and recent bloodwork that I had done here. As far as we know, it is still pre-cancer, and even if it were to become cancer, this type is very treatable with a 90% survival rate. But we do hope to remove the abnormal tissue before it becomes cancer. While it is very treatable, it is also a bit unusual since I have no risk factors, so we feel like I need to continue to follow-up with this specialist at Emory. All of these factors have led us to lean toward me returning in January. Also, it is generally less expensive to travel in January than in December and we would like to all be together for Christmas. We are also thinking that I will bring Ezra with me. It would definitely lighten the load for David here and Ezra would enjoy the opportunity. Zeke did not travel well, so we think it would be best for him to stay here. We have been praying about this and our team here has been praying for us also in this matter. But we would also like for you all to pray that we would have wisdom regarding these plans. There are so many factors to juggle, but we trust that God has all of those in his hands. We will contact the missions travel agency that we work with soon, in order to begin to look for flights. Although this health concern adds expense and will require us to be apart as a family, I am trying to thank God for the blessings this "opportunity" will provide. I am looking forward to the chance to see family and friends much sooner than we originally thought. It also gives me the ability to connect in person with much of our support team and share more about what God is doing here. I think it will also be good for me to have special time with Ezra. Thank you for your prayers for our family as we consider this upcoming trip! There are also two babies here that I would ask you to please pray for. The first is Rebecca. She is the daughter of the pastor at the village church near GSF and her mother and I are prayer partners. She is 8 months old and is in the hospital very sick with malaria. The other is a baby named Alex who is over a year old, but is terribly malnourished. Here is a photo of him. He came to GSF a few weeks ago and he is not eating well and having some medical complications. Claudia is now caring for him in her house. She has nursed many very sick children back to health over the years. Please pray for healing for these children and wisdom and comfort from the Lord for their caregivers. I cannot express how heartbreaking it is to see a baby so sick and to feel so helpless. God is teaching me a greater dependence upon him each day, and showing me the power of prayer. Thank you for partnering with us in prayer in all of these situations! Praying for all of the children at GSF. Praying for you guys too... continue to work hard. We are praying with and for you.